This template is converted from wordpress theme. 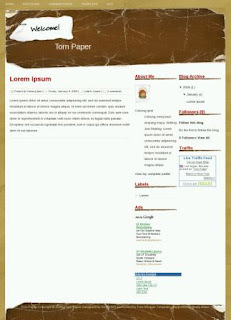 I love simple layout so I convert this theme to blogger template. Very easy to customize. No need to upload anything. your blog is very good.and i think your blog is better than mine. suggestion? i shold thank you very much. Boleh di unduh ni templatenya? wow makin serru ajanih blog..
Bong, sa'-jane aku pingin nembak dan dadi juru kunci nang kene. Tapi, berhubung rong-jane, aku selalu telat. i am using "torn paper" for one of my blogs. i'm just wondering if there's anyway of changing the font colour of - about me, followers.......to something else? Hi there, I love the template and I have adapted it on one of my blogs: http://www.dialogvisual.com/ but after the first entry, the link to leave comments disappeared. Any idea why it might be? I know that other people have had this problem with third party templates in Blogger. Any help would be greatly appreciated as I am tearing my hair out over this! Thanks for your quick reply. I've compared the code for the comments section and can't see any differences...and I've tried all the options of embedded, pop-up etc :-( but thanks anyway. everlastitch.blogspot.com. however, i find the labels have been missing. what should i do? i'm new in blogging.hope you can help..
hi..sorry, would like to ask again..at the top of the layout, there are home, posts rss etc. I might ask questions later on...again..
Really sorry if bothering you..